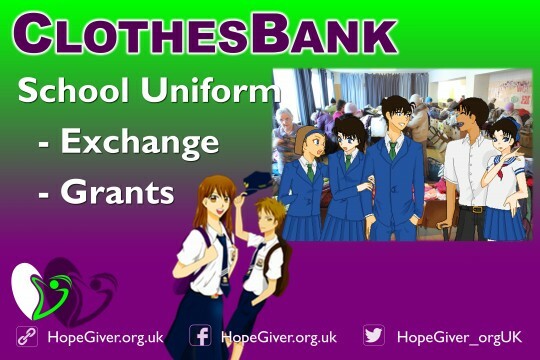 There are two elements to the project: a) school uniform exchange; b) grants for new uniforms. We receive donations of clothing from members of the community - parents and families that have school uniforms no longer needed, but are in good condition. We collect, sort and store uniforms and give them to those who need them and can make use of them. When we cannot give donated clothing, we will provide a small grant to purchase new items as required. School uniforms come at a cost - and it's a cost that is far too much for many families. Many families reliant on benefits, and others on low income, struggle to make sure their children have the right uniform all the way through school. As they grow so quick, and sometimes as they wear out so quick, it is a constant drain on the family's finances, leading to real hardship. All those who receive gifts of clothing or small grants form us are referred to us following a comprehensive assessment of their needs and their financial status. Other avenues of funding are explored - often, grants are available from other sources, and our aim is to reach and help those who would otherwise slip through the net, where other sources of help are not available.